St Paul’s Alumna Sally Andrews graduated from St Pauls in 2011, as the International Baccalaureate (IB) Dux. She was also the School Vice-Captain. 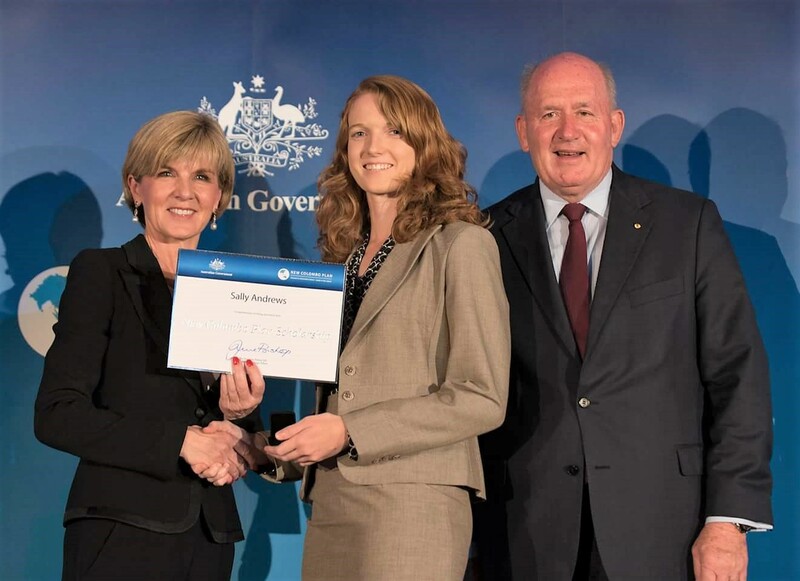 In 2017, Sally graduated with a Bachelor of International and Global Studies / Bachelor of Laws from the University of Sydney. Sally was admitted as a solicitor in the Supreme Court of New South Wales in March 2018 and is a Policy Adviser in the Department of Prime Minister and Cabinet. What was your favourite subject at school? Why? My favourite subject was International Baccalaureate Diploma History. It was quite an intense and rigorous course covering the major wars and European dictatorships of the last two centuries. It also covered less mainstream topics such as the Spanish Civil War and the Chinese Civil War. Having a solid understanding of Chinese history in particular, has been incredibly valuable in my later life. I was inspired by my aunt, Shelley Houghton, who during most of my childhood, was living up in West Papua and working for Uniting World (the aid and development branch of the Uniting Church in Australia). My aunt has spent her life working with disadvantaged communities. She is a very committed Christian and she exemplifies for me the way that one person can make a real difference in the world. During my working hours, I assist with a range of tasks such as preparing advice, writing legislation and liaising with various stakeholders in our department and beyond. Quite often this will involve a fair bit of running around Canberra to attend meetings with other departments and chase up issues at Parliament House. I go running or rock climbing most afternoons, I often play music at church and I play piano accordion at a weekly Irish session at my local pub. How did school help consolidate your career path? I did my Extended Essay in IB History focusing on the role of the Dutch, the United States of America, and the United Nations in the annexation of West Papua. That essay was an absolute watershed moment for me. It ignited my passion for human rights and international law and has very much shaped the direction of my career and studies. Where do you see yourself headed in the future? I hope to move into working on international policy in the future, focusing on Australia’s relationship with Southeast Asia and the Pacific. I can see myself doing a Masters in this area in a few years’ time, perhaps whilst concurrently working for the government. I would love to work overseas again and I certainly have my heart set on getting a role with the United Nations one day. What challenges have you encountered? How did you overcome them? I had problems with my mental health during the latter years of law school, where the anxiety of trying to get top marks and applying for jobs was quite debilitating at times. I was eventually able to manage the problem by attending counselling, getting the right medication and going hiking a couple times per month. I also became sick with typhoid during my exchange in Indonesia - recovering from that, both physically and mentally, was really tough. I persevered with my studies though by taking each day at a time and building strong routines. Have you travelled since leaving St Paul's? If so - where, and how has this influenced you as a person? I travelled to Jakarta when I was first learning Indonesian and became awfully sick with amoebic dysentery. I interned in Papua New Guinea and was attacked by a dog. I then lived in Yogyakarta, Indonesia for six months, during which I was hit by a car and then got typhoid. I also went viral as an Indonesian rapping celebrity, climbed the tallest mountain in Java, rode a horse round the crater of a live volcano, and took a selfie with a Komodo dragon. These experiences have made me more resilient as a person, and more passionate about improving Australia’s engagement with the Asia-Pacific. In 2017 I worked in New York as an intern to the Australian Mission to the United Nations. This was an utterly amazing time in which I walked to the UN every day, sat in the Security Council with world leaders like Theresa May and Mike Pence, befriended other young interns from all over the world, scrabbled for cheap theatre tickets at Broadway, and played accordion at Irish sessions all over the city. It was an amazing moment to be able to give my parents a personal tour of the UN. It has made me even more determined to get back to work at the UN one day. Do you have a favourite memory from your time at St Paul's? I have great memories from the St Paul’s Creative Writing Camps. would be classic novels and books of poetry and musical instruments all over the place. It was a great atmosphere for kids who loved English to flourish and to socialise with people from all different year groups who just loved writing. What is one piece of advice for current St Paul's students? The theologian Frederick Buechner says that “the place God calls you to is the place where your deep gladness and the world’s deep hunger meet.” My advice to current St Paul’s students is along the same lines- try to find something you can be passionate about that helps others. It does not have to be human rights law- I have a friend who designs smartphone games in which a cut of the sales goes towards a Nepalese aid agency. If you can find that overarching goal or purpose that motivates you AND helps others, it becomes so much easier to get through subjects, activities or jobs that you do not enjoy as much.